There’s ice as far as the eye can see, and I don’t mean the good kind, like the ice cubes you’d find in a glass of lemonade on a hot summer day. No, I mean the kind that lets you know that winter’s here to stay; at least for a few months, and I’m sure you’ve made all the necessary preparations to get ready. Considering everything that you’ve done for yourself and your home to prepare for winter, you probably neglected one of the most important things on your property, and that’s your awning. You’ve gotten use to seeing your awning out covering your patio or deck, but sadly it can’t stay out forever. 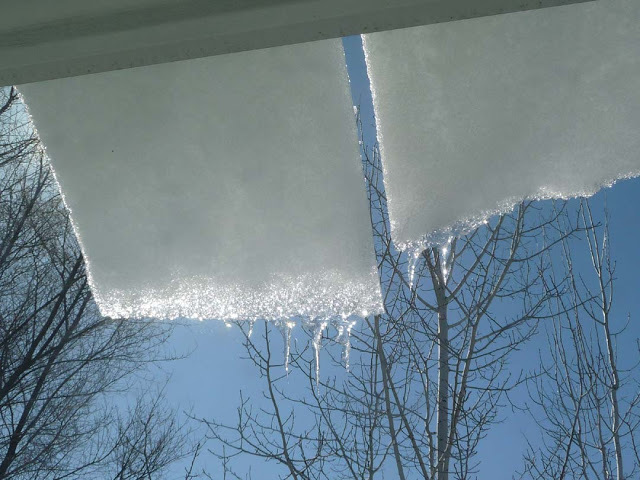 Eclipse retractable awnings are built to last and withstand a variety of weather, but accumulating snow and ice can damage your awning. Luckily, there are ten things you can do to ensure that your awning stays protected during the long winter months. 1. Inspect your awning or shade structure for damage: Make sure that all components of the awning are secure and check the fabric for any worn spots and tears. Inspect the stitching around the edges of the fabric to make sure that it isn’t beginning to unravel. Finally, if your awning has a valance check to make sure that it isn’t worn. Valances tend to flap and flutter with every gust of wind, which can cause extra wear and tear to the fabric. 2. Repair your awning: If you noticed any rips or tears in the fabric it’s best to take care of the problem right away instead of waiting until you bring your awning back out for the spring. Tiny tears can turn into large holes, and stitches can come undone completely. Remember, it’s easier and less expensive to repair a tear than it is to replace the entire awning. 3. Dust off your awning: You probably didn’t think about it much while you were enjoying your awning, but all that time out in the elements did a number on your favorite home accessory. The wind blew dust, dirt and pollen all over it, leaves accumulated on the top of the awning and in the crevices, and little critters scurried across it. To put it simply, the top of your awning is probably a mess. More importantly, you have to make sure that there’s nothing on your awning that could scratch or tear the fabric when you’re ready to wash it. 4. Wash your awning: Use a soft cloth and soapy water for this. Harsh cleaners and abrasive scrubbers can damage the fabric of the awning. 5. Dry your awning well: You may think that you can simply wash off your awning and allow the sun and wind to dry it for you, but that would be a mistake. Drying your awning thoroughly helps to prevent mold and mildew from forming on the fabric. The awning can finish air drying after you’ve dried is as good as possible. 6. Take off any removable parts if necessary: Some shades have removable valances that need to be stored. This is especially true for some patio and pergola solar shade structures. Remove the valance and wash it if necessary. Dry it well and roll it up neatly, then store it in a dry place. 7. Retract your awning: If you have a motorized retractable awning this is easy to do. With the press of a button your awning can be tucked away inside its case. 8. Check for any hanging fabric: Make sure that there is no fabric that’s loose or hanging out of the awning’s housing. If there is, tuck it inside to keep it protected. 9. Cover your cover Use a winter cover to protect your awning, if you have one. This type of cover fits directly over the awning to keep it protected from the winter weather and any bugs that may wish to make their home inside. 10. In some cases it may be necessary to remove your awning completely. This can happen if the housing is damaged or if you have a type of shade that isn’t retractable. Simply follow the manufacturer’s storage instructions to take the awning apart and put it away properly. If you don’t have a box or case for the awning, wrap it in a sheet or some other type of covering to keep it protected and store it in a dry place.